"This drink starts with a simple shrub--a tart, fruity liquid you make ahead and can also sip straight up or with seltzer." Puree cantaloupe, sugar, and champagne vinegar in a blender. Stir in lime zest. Chill, covered, 4 hours to 2 days. Strain. 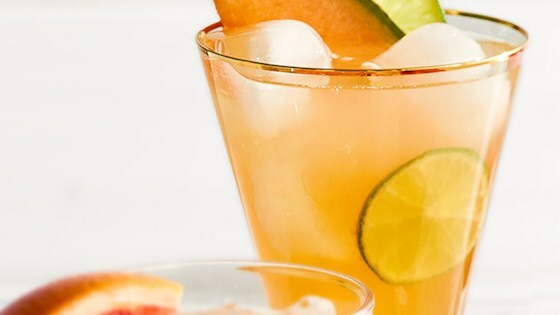 In a cocktail shaker half-filled with ice, combine 2 fluid ounces cantaloupe shrub, rum, and lime juice. Shake until very cold. Strain into an ice-filled wine glass or water goblet. Garnish with slices of cantaloupe and lime. The shrub recipe makes 2 cups, enough for 8 drinks or cocktails. Shrub keeps up to 3 weeks, chilled. Nutrition data for this recipe includes the full amount of shrub. The actual amount consumed will vary.